He joined the Birmingham and Derby Junction Railway in 1839 as the traffic agent at Hampton in Arden, becoming Chief Clerk, then General Manager. 1844 When it merged and became the Midland Railway, he moved to George Hudson's York, Newcastle and Berwick Railway until it merged into the North Eastern Railway. 1850 Six years later he assumed the charge of the Manchester, Sheffield and Lincolnshire Railway, now the Great Central Railway. 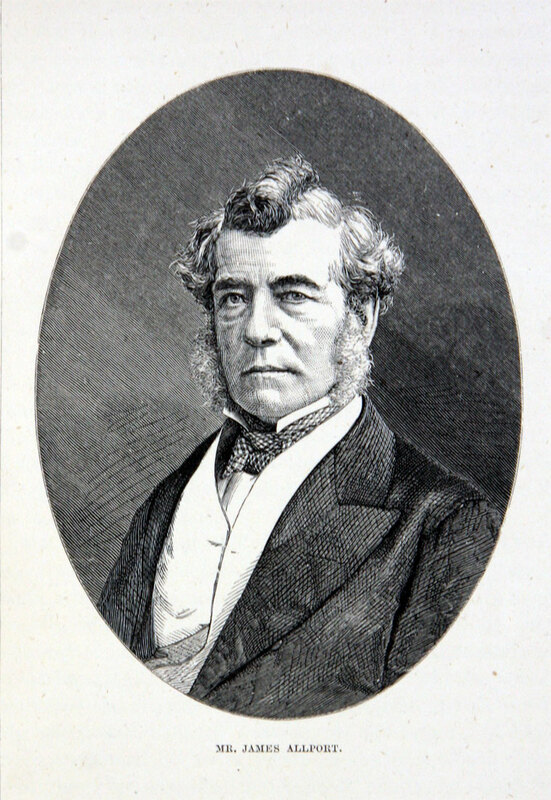 1853 He was appointed to the general managership of the Midland Railway; an office which he held continuously, with the exception of a few years between 1857 and 1860, when he was managing director to Palmers Shipbuilding and Iron Co at Jarrow, until his retirement in 1880, when he became a director. During these twenty-seven years the Midland grew to be one of the most important railway systems in England, partly by the absorption of smaller lines and partly by the construction of two main extensions on the south to London and on the north to Carlisle whereby it obtained an independent through-route between the metropolis and the north. He was instrumental in the Midland's partnership with the M, S & L, which led to the "Sheffield and Midland Railway Companies' Committee", and gave the Midland access to Manchester for its London trains. In the railway world Allport was known as a keen tactician and a vigorous fighter, and he should be remembered as the pioneer of cheap and comfortable railway travelling. He was the first to appreciate the importance of the third-class passenger as a source of revenue, and accordingly, in 1872, he inaugurated the policy, subsequently adopted more or less completely by all the railways of Great Britain, of carrying third-class passengers in well-fitted carriages (at the uniform rate of one penny a mile on all trains decreed by Parliament). The diminution in the receipts from second-class passengers, which was one of the results, was regarded by some authorities as a sign of the unwisdom of his action, but to him it appeared a sufficient reason for the abolition of second-class carriages, which therefore disappeared from the Midland system in 1875, the first-class fares being at the same time substantially reduced. SIR JAMES JOSEPH ALLPORT, born in 1811, was a son of the late William Allport, of Birmingham, who, as a manufacturer of small arms, executed large contracts for the English and other governments during the Napoleonic campaigns and also assisted in establishing the Birmingham Proof House Co, of which at the time of his death he was Prime Warden. At an early age the subject of this notice was sent to Belgium to be educated. He returned to this country shortly before the death of his father, whose affairs involved him in considerable difficulties owing to the serious financial and commercial depression which had prevailed between the years 1820 and 1825. 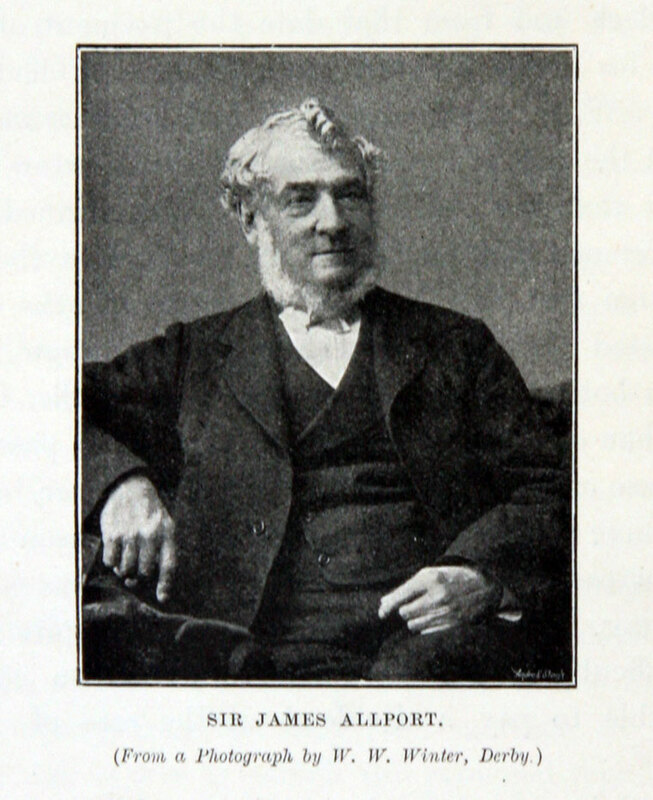 Mr. Allport was 28 years of age when in 1839 he commenced his railway career in the service of the Birmingham and Derby Company as agent and representative for all descriptions of traffic at Hampton, the point of junction with the London and Birmingham Railway. He soon became manager and it was under his auspices that the fierce competition began between his line and the Midland Counties and the North Midland Railways, which ended in the amalgamation of the three companies in April, 1844, under the style of the Midland Railway. 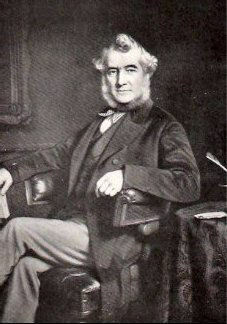 Mr. Frederick S. Williams in his work on 'The Midland Railway: its Rise and Progress,' states that, so great was the conflict between the Midland Counties and the Birmingham and Derby that the latter Company, in its endeavour to attract the London and Derby traffic, reduced its through fares to 2s. first-class and 1s. 6d. second-class over the 38 miles from Derby to Hampton, while the local fares between those two places were maintained at 8s. first-class and 6s. second-class. At the amalgamation there was of course no room for three staffs of officers. The North Midland Company’s manager became the manager of the new Midland, and as the Birmingham and Derby was the least important of the three, Mr. Allport’s services were dispensed with. He had, however, already made his mark, and the Chairman of the Midland Company - Mr. Hudson, or 'King' Hudson as he was popularly called - at once asked him to take charge of the Newcastle and Darlington Railway. Great efforts were being made at that time to establish an east coast route to Scotland and an important item of Mr. Allport’s new duties was to organize a through service of coaches to bridge the gap between the Scotch and English lines. At that time the battle of the gauges was raging and, in order to show that the narrow gauge was not incompatible with high speed, Mr. Allport made a run from Sunderland to London and back with the account of Mr. Hudson’s election as Member of Parliament for the former town. Leaving Sunderland at 5 pm. he travelled via York, Normanton, Derby, Rugby and Wolverton to Euston, drove to The Times office, where his manuscript was immediately set up in type and inserted with a leading article ; and, armed with several impressions, arrived at Sunderland at 10 o’clock the next morning, before the announcement of the poll. The distance travelled was 600 miles, which, allowing for the two hours spent in London, gave an average of 40 miles an hour. During the six years of his connection with the Newcastle and Darlington line it developed into the York, Newcastle, and Berwick Railway. He was next, for three years, Manager of the Manchester, Sheffield, and Lincolnshire Railway, after which he returned in 1863 to take charge of the Midland. Under the management of Mr. Allport the Midland rapidly developed from a series of local lines into one of the great trunk railways of the kingdom. The southern terminus of the line was then at Rugby, and for some years efforts had been made to get nearer to London. So great, however, was the opposition of its powerful competitors, the London and North-Western and the Great Northern, that the idea of amalgamation, first with the former and then with the latter, was for a time entertained. The Midland Company, with its 500 miles of railway and £17,000,000 of capital, could no longer be kept more than 80 miles from the metropolis, at Rugby, where it was delivering to the North-Western a large and constantly increasing goods and passenger traffic. At length, in 1853 an Act was obtained for an extension from Leicester to Bedford and then on to Hitchin, whence running powers were granted over the Great Northern system to London. It was a time of financial depression and some difficulty was experienced in raising the necessary capital. It was not, therefore, until May, 1858, that the Leicester and Hitchin line was opened. In the previous year Mr. Allport had retired from the service of the Midland in order to accept the post of Managing Director to Palmer’s Shipbuilding Company at Jarrow-on-Tyne. He did not, however, entirely sever his connection with the Midland, for he was appointed to a seat on the Board of Directors of that Company. His new occupation was not destined to last long. In 1859 and 1860 most determined efforts were made by the London and North - Western, the Great Northern and the Manchester, Sheffield and Lincolnshire to effectually bar the Midland from access to Manchester and to the North. In the latter year, therefore, Mr. Allport was requested to resume the position of General Manager of the Midland, and it was mainly owing to his evidence before the Parliamentary Committees that the schemes of the rival companies were defeated. The latter, however, still succeeded by mutual arrangements in shutting out the traffic of the Midland from Lancashire; the North- Western barred the way at Stockport, and the Manchester, Sheffield and Lincolnshire at Hyde. It became evident that a new policy must be adopted and strenuously carried out; the Midland must make itself, as far as possible, independent of its rivals. In spite of the great opposition of the North-Western and Great Northern, an Act was obtained in 1862 for an extension to Manchester through the Derbyshire dales. The works were at once put in hand and the line was opened on the 1st of June of the following year. Another and even more important extension was now demanding Mr. Allport’s consideration. Both the goods and passenger traffic to London were increasing so enormously that the accommodation and facilities provided by the Great Northern between Hitchin and King’s Cross were totally inadequate. In 1862, when an Exhibition was held at South Kensington, nearly 1,000 Midland passenger trains and 2,400 goods trains were delayed between those two points. Moreover, the North-Western, which in the same year had carried from Rugby to London Midland goods traffic to the extent of nearly £200,000, was becoming less and less able to accommodate it. It was absolutely necessary that the Midland should have a line of its own to London and in 1863 an Act was obtained for the extension from Bedford to St. Pancras. The works, constructed to accommodate four lines of rails, were pushed forward as rapidly as possible ; but it was not until the end of 1868 that the first passenger train ran into the magnificent station at St. Pancras, with its roof of one span of 240 feet, its lower floor for the storage of Burton ale, its great hotel and its extensive goods dep6t. In the previous year, however, the Directors had created a temporary panic amongst the shareholders by applying to Parliament for power to raise additional capital to the extent of £5,000,000. This was rendered necessary, not only by the excess of the actual cost of the extension to London over the Parliamentary estimates, but by three other new works then in progress - a direct line from Chesterfield to Sheffield, which had hitherto been approached by a branch from Masborough ; direct communication with Liverpool, in conjunction with the Great Northern and the Manchester, Sheffield and Lincolnshire; and an extension from Settle to Carlisle, which, with the co-operation o€ the Glasgow and South-Western, would enable the Midland to share, for the first time, in the enormous traffic carried on between this country and Scotland. The necessary powers for these three schemes had been obtained in 1864, 1865 and 1866 respectively. Mr. Allport, however, reassured the shareholders, and the additional capital was raised without difficulty. One sacrifice was made to economy-the great hotel at St. Pancras was built without the storey intended in Sir Gilbert Scott’s original design to accommodate the officials of the Company who still remain at Derby. In the year 1872 occurred one of those events in the history of the Midland Railway Company with which Mr. Allport’s name will always be associated. It was decided to run third-class carriages by all trains, an innovation which, although it met with great disfavour from his competitors, he declared to be for the benefit of the public and of the railway companies a1ike. The result was a remarkable improvement in the receipts and in the number of passengers carried, and it was found that, as duplicate trains were no longer needed, the expenditure was actually diminished, instead of increased, as the opponents of the change had predicted. Another result, however, soon became apparent that the second-class traffic was largely diminished, while the third-class traffic enormously increased. In 1873 it was found that the revenue from first-class passengers was about 8d. per mile, that from second-class 7d., while that from third-class was no less than 2s. 8d., or more than twice as much as the two higher classes together. It was clear, therefore, that the trains must be carrying a large and increasing proportion of dead weight in the form of empty second-class carriages, and hence Mr. Allport was induced to consider whether it would not be better to abolish that class entirely. In order that the second-class passenger should not suffer, he reduced the first-class fare to the second class scale. Judging from past experience he anticipated that this change would result in no loss of revenue but in economy of working, lightening of trains and greater punctuality. This revolution, as it was called by the daily press, startled the railway world and the public generally, and a storm of criticism and opposition ensued. Mr. Allport, however, stood firm and, as the arrangements for the working of the new policy came to be seen, it was found that the improvements in the third-class carriages were so great that the actual result of the change was to provide first and second-class accommodation at second and third-class fares. The introduction of Pullman carriages at this time was due to Mr. Allport’s enterprise - an innovation which was at once successful and destined to be developed into a system of luxuriously- appointed sleeping- and dining-cars, privileges to which third-class passengers are now admitted. Another reform which Mr. Allport effected about that time was the purchase of something like forty thousand wagons, principally coal wagons, previously owned by no less than three hundred different proprietors. He had stated in a discussion on 'Railway Rolling-Stock' before this Institution, that it was the interest of all railway companies to possess the entire rolling-stock of their 1ines. The number of accidents occurring with the wagons of private owners, over the construction of which the company had no proper control, was much larger than with the railway’s own stock, and the cost and labour of marshalling and shunting empty wagons, when mixed together, in order to deliver them at the respective collieries to which they belonged, were extremely great. In the year 1880 Mr. Allport, whose health was then in a precarious condition, felt obliged to resign the post which he had so long held. Thinking that by so doing they were treating him much more generously than by granting him a retiring pension, the shareholders of the Midland voted him a sum of £l0,000. Relief from toil and responsibility, however, seemed to inspire him with new life, and he showed, not only in connection with the Midland, of which he was elected a Director, but also on the Boards of smaller undertakings, that he had still a dozen years of work left in him. In 1884 the somewhat tardy honour of knighthood was conferred upon him, and two years later he was appointed a member of the Royal Commission on Irish Public Works. Sir James Allport was a Justice of the Peace for the county and borough of Derby, and from 1853 to 1880 was a Lieutenant-Colonel in the Engineer and Railway Volunteer Staff Corps. He was elected an Associate of the Institution on the 7th of March, 1865, and frequently took part in discussions on railway matters. In addition to those already referred to, he spoke during the course of debates on communication between passengers and guards, and on uniform gauge. ↑ The Engineer 1892/04/29, p365. This page was last edited on 21 April 2017, at 11:36.